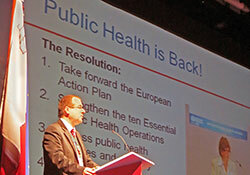 Participants in the annual conference of the European Public Health Association (EUPHA), held in Malta, welcomed the launch of the WHO European Action Plan for Strengthening Public Health Services and Capacity on 9 November 2012. The Action Plan points out a clear way to strengthen public health in countries across the WHO European Region, and forms a key pillar of the implementation of Health 2020, the new European policy framework endorsed by the WHO Regional Committee for Europe in September 2012. Dr Hans Kluge, Director of the Division of Health Systems and Public Health at WHO/Europe, outlined plans to modernize public health to address widening inequalities and the increasing challenges of the 21st century. With an ageing population and increasing chronic disease, countries must develop and strengthen services for disease prevention and health promotion, while ensuring robust health protection services to address risks to health from pandemic influenza and climate change. At present, the health sector’s spending on prevention across the Region is estimated to average only 3% of total spending. Yet a relative increase in spending is a cost-effective way to improve health outcomes. For example, prevention initiatives account for 50–74% of the decline in coronary heart disease morbidity in a range of high-income countries. Dr Kluge emphasized that countries need to work together to transform and scale up public health services in order to reduce health inequalities and promote greater health and well-being now and for future generations. The Action Plan presents 10 essential public health operations (EPHOs) that countries can adapt and work on together, with WHO technical leadership and support, to assess and plan stronger public health services and capacity. With key partners, WHO is already taking forward the component of the Action Plan focusing on developing the public health workforce, holding an initial meeting at the EUPHA conference.